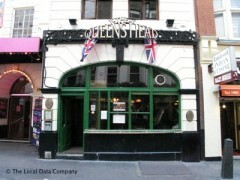 About: The Queen's Head is a small independent pub in the heart of London's West End. Capturing all things British, we pride ourselves upon stocking locally sourced ale's while serving homemade traditional pub food. Situated upstairs from our busy quaint little bar, the restaurant serves a menu of fresh ingredients from sustainable and ethical sources. Popular classics such as our delicious Fish & Chips and our homemade Piccadilly Pies are a big hit with our regulars and first time visitors alike. Next door to the Piccadilly Theatre we also offer a 2 course pre-theatre menu for just £14. If you're looking for quality food and drink, vibrant atmosphere, a building soaked in history and friendly staff then this is the place to be. Despite its mega-touristy location moments away from Piccadilly Circus this freehouse is a haven for fans of traditional boozers and British ales. There’s a classic pub menu (fish and chips, homemade pies) and a pre-theatre special of two courses for just £14. "A small but perfectly formed Free House in an up-and-coming corner of Soho"
Soho is a densely packed area, it has to be said. I worked no more than a hundred metres from this pub, a stone's throw from Piccadilly Circus, for years and never knew it was there. You see there were, and still are, loads of other places to go. I say this because The Queen’s Head is a small but perfectly formed boozer that I wish I had known about. Normal pubs that aren't sticky-tabled, major brewery-owned tourist traps are quite hard to find in W1, and when you do locate one it gets heavily frequented. As a pub it ticks lots of boxes for me: it's a proper free house with a good selection of beers, the décor is nicely preserved late Victorian-era with lots with of polished wood, glass, mirrors and chandeliers, and some leather backed seating. They're gunning to get on the CAMRA radar, which is not common in the West End. Whilst not at the level of the award-winning Harp in Covent Garden, there were enough interesting ales behind the bar to keep a beer lover happy for an evening. The Notting Hill blonde I tried was a nice, hoppy refreshing number. Standards like London Pride and the increasingly seen Wandle bolster the ranks. But it's not just a drinking hole, upstairs there is an equally pleasing dining room where a menu of decent quality gastro fare is available, with a £15 pre theatre deal offered. West End pubs are not generally known for their food, mostly they are the aforementioned joints offering sub-standard takes on 'classic pub food', oven chips, dried up burgers and the like. On the menu here are a range of salads, homemade pies and standards like fish & chips and beef chilli. Our starters of terrine of pork tenderloin and duck breast had a good earthy homemade feel, and a warm salad of grilled halloumi and Jerusalem artichokes was well put together. Prices were around £5-6 for a starter and £9-£11 for a main, so in the gastro zone but not bad for the West End, particularly as the food is actually a decent standard. My rib-eye steak with blue cheese sauce was a few quid more than the rest at £14.25 which is not cheap, but it was a good piece of meat cooked well with very nice hand cut chips – a good litmus test of the amount of love gone into preparing a meal, in my book. The seafood chowder was nicely seasoned and heartily creamy. We were pretty full after all of that so a fruit crumble was shared. An unusual choice of fruits was included – I detected strawberries and pineapple – to 'summer it up' but it wouldn't disappoint a crumble fan, of which I am one. I got the impression it was early days and The Queen’s Head is still trying to find its core customer base; it was pretty quiet the lunchtime we visited when one would have expected more drinkers, let alone diners. But it certainly deserves to do so. This lost corner of Soho looks like its fortunes are changing. Sherwood Street just up the road has recently had a cosmetic makeover along with the newly opened Brasserie Zedel (from the Wolseley stable) across the way. A branch of the perennially popular Jamie's Italian is also slated for the site directly across the street which currently houses an ailing pub. I'm sure The Queen’s Head will benefit from all of this if the area becomes a dining enclave. And when word gets around that it's also a solid pub with decent beer (its listing on Fancyapint still dates from its previous incarnation, for example), the punters will make their own way over with little encouragement. "Pop-up salt beef eatery is a great complement to this freehouse"
As the world’s businesses become but mere links in a chain, freehouses become an increasingly hard thing to find. The main benefit of not being tied to a brewery is the freedom of offering a wider range of drinks. The Queen’s Head, an intimate drinking hole just a minute away from Piccadilly Circus, is one such venture, and as well as having plenty of draught beers and ales on sale (Dark Star Hop Head, Butcombe Bitter and London Pride among others) it feels like it’s miles away from the bustling tourist trap outside. The cosy atmosphere is helped by Victorian-style furnishings like the dark wooden bar, ornate hanging lights and fancy wallpaper. The pub has not long had a refurb therefore the kitchen isn’t fully operational yet; however for the time being salt beef specialists The Bell & Brisket have stepped in. As we discovered, their sandwiches and wraps are decidedly lust-worthy; imagine tucking into thick chunks of soft, warm salt beef smothered in melted blue cheese and tangy Dijon mustard, topped with heaps of pickled cabbage, all the contents oozing out of two slices of toasted rye bread. This is the Lord Rupert, and it comes with little pots of sliced gherkin, mayo, ketchup and a portion of lovely golden chips served in a chef’s hat, all for a tenner. We also tried a wrap with horseradish, salsa verde and beetroot, with a brighter, less rich taste than the sandwich, but equally delicious. Sticklers for tradition can choose the classic bagel with mustard and pickle, and side dishes like pickled daikon, spicy carrot, curried eggs and mild-tasting kimchi are also available. You can sample this comforting menu till the 1st of June. Since new management have taken over, this bar has improved immeasurably. The staff are really friendly, they have a varied selection of real ales, lagers and wines, they have great food and it is a wonderful location in central London. I pop in everytime I am in town.